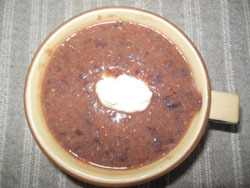 I like to make this black bean soup as it is so easy to make and great way to get extra protein into your diet. I also like to keep it meat less but of course it would be easy to add any meat of your choice. This will make about 5 1-cup servings depending on the amount of water you may add to get it to your desired consistancy.